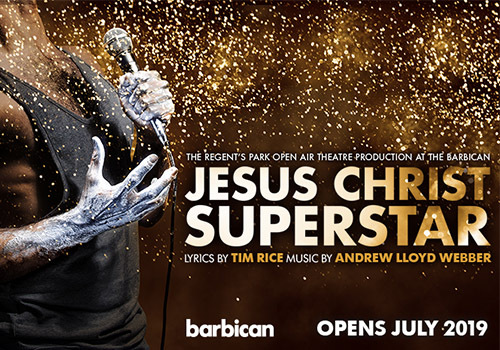 With all the frivolity of a festival and all the drama of a biopic, Regent’s Park Open Air Theatre's production of Jesus Christ Superstar lands at the Barbican Theatre for a limited set of 60 shows in July. Andrew Lloyd Webber's iconic musical is showcased in glorious technicolour following a sell-out season at the Open Air Theatre in 2016 and in 2017. This is the story of the final seven days of Jesus' life, and it features a world-famous soundtrack that includes the numbers "I Don't Know How to Love Him", "Hosanna" and the eponymous "Jesus Christ Superstar". Timothy Sheader's stylish direction finds a fitting home on the Barbican’s sprawling stage. Handsomely awarded during its previous runs, the production won the Evening Standard Award for best musical and the Olivier Award for best musical revival. Critics doted on it, with The Telegraph dubbing it "an almighty revelation" and The Guardian commending its "wit, lyricism and satirical bite". A unique incarnation of the enduring musical, this offering boasts an X-Factor sheen and a large supplement of glitter. Andrew Lloyd Webber is the composer of 13 musicals including Joseph and the Amazing Technicolor Dreamcoat and School of Rock, as well as two film scores, a Latin Requiem Mass and more besides. In 1992 he was knighted, and over the course of his career he has received a stack of prestigious accolades: six Tonys, an Academy Award and seven Olivier Awards among others. The show's lyrics are the work of lyricist Tim Rice, a long-time collaborator of Lloyd Webber’s. He has also been knighted by Queen Elizabeth II and is a recipient of the quadruple whammy: an Emmy, Grammy, Oscar and Tony Award. Timothy Sheader is currently the artistic director of the Regent's Park Open Air Theatre. He has directed productions across the world, such as Barnum at Chichester Festival Theatre and My Fair Lady at the Aarhus Teater, Denmark. Choreography for the production comes from Drew McOnie, while musical direction is the work of Tom Deering. The cast of Jesus Christ Superstar includes Robert Triploino as Jesus, Sallay Garnett as Mary, Ricardo Afonso as Judas, and Matt Cardle as Pilate. Cavin Cornwall (Rip It Up) and Nathan Amzi (Heathers the Musical) also star. Revel in the glitz, the high-emotion drama and the heart-rending songs of this critically acclaimed production of Jesus Christ Superstar. It plays at the Barbican Theatre from 4th July 2019 for a limited season. Click here for the Barbican Theatre seating chart and seat price guide.